MOTORHEAD - THE WORLD IS YOURS VOL. 1 - EVERYWHERE FURTHER... (2CD+DVD DIGI) | Online Shop | Wizard LTD. Album: "THE WORLD IS YOURS VOL. 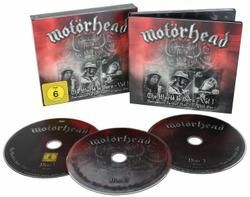 1 - EVERYWHERE FURTHER... (2CD+DVD DIGI)"
- MOTORHEAD live across the globe: Chile, the USA and England! The digipak version boasts two additional live CDs [!] - МЕГА РАЗПРОДАЖБА!! ВАЖИ ДО ИЗЧЕРПВАНЕ НА ОПРЕДЕЛЕНИТЕ КОЛИЧЕСТВА! !